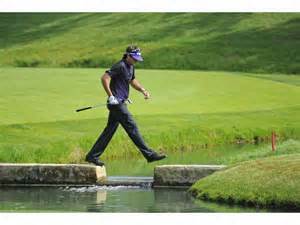 Bubba Watson navigates a water hazard. Thousands of golfers have suffered and played through allergies and headaches during days on the links. Was this response reasonable or merely an excuse to end the misery a first-round stratospheric number can create? In the end, it is the player’s call. When is it justified to walk out on a tournament? If you asked my dad, Buck Parrott, the answer would be ‘never’….except for serious injuries. Although Dad passed away in July of 2009, the anecdotes from his life frequently come to mind, especially when events like Bubba’s withdrawal pop up. Personally, I’ve had injuries and played through them. One time, I pulled something in my left shoulder half-way through the round and by the 17th hole could no longer take the club away past hip high. But I finished, shooting 76 in the process. How? I don’t know. I’ve had horrible rounds in major competitions: at former USGA President Judy Bell’s annual event, the Broadmoor Invitational in Colorado Springs, one of those rounds surfaced. I carded a 90 while my playing partner, who was keeping my scorecard, shot 69. When I approached the Scorer’s table, I overheard one of the committee members say to her “wow, you shot 69 while playing with someone shooting 90??? That must have been hard to deal with!” I’ll admit the score was much worse than I played, but who ever cares to know that? My playing partner graciously demurred from the question; I signed my card and slinked away. Are high scores embarrassing? Of course they are. Is anyone immune to them? Of course they aren’t. Should you quit because you’ll end up with a high number? That’s up to you. Anyone who thinks they will never shoot a bad score will indeed be humbled by the golf gods – and you may include those who ridicule you because of a high score. When it comes, accept it. Own it. You can look forward to redemption later when the tide turns. You know it will.